PROOF OF HEAVEN, Dr. Eben Alexander's book on what he describes as his journey to the afterlife came out a month or so ago, accompanied by features in Newsweek and ABC. (Links below). Dr Alexander is a Harvard Med school trained neurosurgeon. I haven't gotten to read it yet, but from what I've heard it's another in a long list of accounts of NDEs, Near-death experiences. 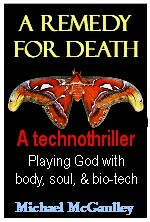 I've made a study of those accounts over the years as I was researching my technothriller A REMEDY FOR DEATH. Among them: HEAVEN IS FOR REAL, by Todd Burpo, an account of a four-year old's NDE. Others by Raymond Moody, Kenneth Ring, Melvin Morse, and Elizabeth Kubler-Ross, all physicians. Also P.M.H. Atwater. Also another first person account by a doctor of his NDE from illness during World War II. Alas, his name escapes me at the moment, and I''m away from my books, so will have to add it when the name comes to me. Note that this happened a good many years back, long before there had been much written on Near-death experiences, or Out-of-body (OBEs--closely related), so the skeptics can't accuse him of jumping on a bandwagon. Update: that was Dr George Ritchie, and it seems it was his experience that intrigued Dr Raymond Moody. Dr Ritchie was a physician and psychiatrist. I won't list titles here, as all of these people have books still on Amazon, BN and maybe even your local bookstore. Newsweek article: "Heaven is real: A doctor's experience with the afterlife"
ABC link: "Neurosurgeon describes . . . "